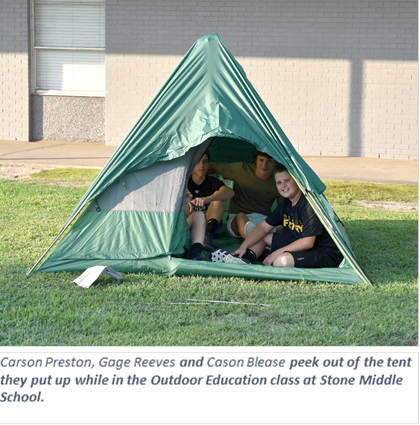 Eighth graders who are enrolled in the Outdoor Education class at Stone Middle School will be learning an array of outdoor skills this year. On Friday students were seen on the campus lawn putting up tents. Working in groups they unpacked tents, followed the enclosed instructions on how to put them up, then took them down and repacked them. This year the class, taught by David Pasternak, will learn such outdoor skills as angling, hunting, archery, boating and outdoor cooking.